Weekly Pill Wallet 4 Compartments For Identification. 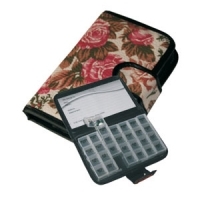 This discreet wallet contains seven individual daily pill boxes, with 4 compartments in each being marked, Morn, Noon, Eve and Bed for easy identification. A user identification card is on the inside cover. The attractive imitation Tapestry design will grace any sideboard, etc. The item was as described and fit for purpose.